Ten years — Clap Your Hands! Ounsworth (in the hat) is the only original Clap Your Hands’r, morphing the band and its sound to challenge his audience. Dude, you are old. One of the first underground hits born of the internet is celebrating its tenth anniversary. 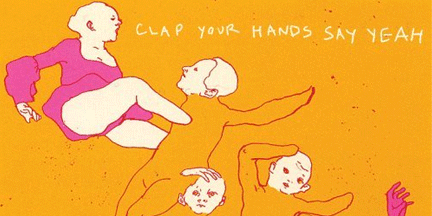 Slap those palms together in honor of Clap Your Hands Say Yeah’s debut album tour! So, a decade down the road, how does CYHSY mastermind Alec Ounsworth feel about his band’s sudden success via internet chatter? Perhaps the most impressive feat is that the band has self-released their albums in the U.S. They have avoided record labels in this country, but Ounsworth isn’t certain every band should go this route. Friday, June 12, 2015, 8 p.m.
Clap Your Hands Say Yeah play Casbah on Friday, June 12.